The battle lines are drawn for the most ambitious infrastructure project of the Municipal Corporation of Greater Mumbai (MCGM)—a 30.7 km coastal road. This road, proposed on the western seaside of the city, aims to connect Tambe Chowk at the southern end of Mumbai to the Kandivali Junction and Madh Island at its north end via the existing Bandra-Worli Sea Link. The MCGM claims this will not only cutdown travel time between the island city and the western suburbs, but also create open green spaces such as gardens, promenades, cycling and jogging tracks. “It is not just a road project. It is a comprehensive project which includes a BRTS (Bus Rapid Transit System), several interchanges for smooth traffic movement and decongestion of the city, seafront development and open green spaces, protection of the coast and flood management,” says Sanjay Mukherjee, additional municipal commissioner (projects), MCGM. But urban planners and environmentalists are aghast at the civic agency’s warped logic of constructing a road by reclaiming 181 hectares (ha) of land and chopping off mangroves, to provide open spaces and decongest Mumbai. Increasing road space does not reduce, but increases traffic congestion, says Hussain Indorewala, assistant professor, Kamla Raheja Vidyanidhi Institute for Architecture and Environmental Studies (KRVIA), Mumbai. In June 2011, the Maharashtra government set up a committee of officials from the Centre and state government, independent urban planners, and architects, to study various options of the coastal road to decongest the existing roads. The committee submitted its report in December 2011 proposing two alignment options for the 35.6 km coastal road. Two years later, MCGM hired STUP Consultants Pvt Ltd, and Ernst & Young Pvt Ltd to prepare a fresh report. Submitted in February 2015, the report recommended a 30.7 km coastal road, which will be a combination of land reclamation, bridges on sea, elevated roads, roads on stilts, and two undersea tunnels. Construction of the project is yet to begin as it awaits the Coastal Regulation Zone clearance from the environment ministry. The project started facing stiff resistance since last October, when the report prepared by the consultants was released for public suggestions. “Citizens do not know the final plan. Alignments are changing daily and the civic agency is not open to any dialogue,” alleges Darryl D’Monte, chairperson of the Forum of Environmental Journalists in India. He isn’t wrong. In April this year, MCGM opened tenders for the first phase of the project even as alignments are still being worked out. It also scrapped one of the two proposed undersea tunnels between Backbay and Priyadarshini Park as a cost cutting measure. Ashok Datar, an economist, thinks MCGM is spending a huge sum on a relatively small number of private car users. “About 80 per cent population of Mumbai uses public transport and only 5-7 per cent use private cars. Of these, only 1.23 per cent, or 0.2 million are expected to use the coastal road daily,” he says. It would be better, Datar says, to spend the sum on strengthening the public transport system. “The coastal road is planned along the western coast of the city. Unless a commuter has to travel from one end of the city to the other end, why will he drive to the far end of the western coast and then come back into the city after a few kilometres?” questions Indorewala. Zohra Momin, an urban planner with the Mumbai office of IBI Group Inc, a global architecture and planning firm, says the coastal road is against the principles of National Urban Transport Policy of 2006, according to which the aim of a transport project should be to transport people, not cars. “A high population density city like Mumbai needs high capacity transit, such as Metro rail or BRT,” says Momin. The project is also likely to affect the livelihoods of many fishers who live in koliwadas (fishing villages) along the road’s proposed route. Indorewala, who has mapped several koliwadas, says the worst affected will be Moragaon, Khar Danda and Chimbai. 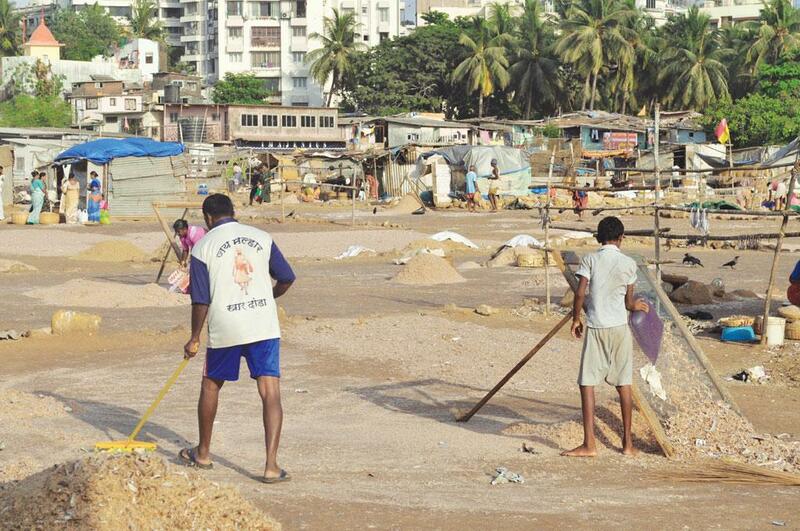 At Moragaon, near Juhu, the proposed road will go over the areas used for drying fish. Reclamation and mangrove removal (43.77 ha) will also destroy the fish breeding sites, Indorewala adds. Datar has a three-point alternative plan. Firstly, the capacity of suburban railways can be increased by introducing 10 additional trains during peak hour. Secondly, BRTS need to be implemented on the main arteries of Mumbai-Western Express Highway and the SV Road. A pilot 3.5-km BRTS is already under way at Bandra Kurla Complex. Lastly, land-use in Mumbai should combine commercial and residential centres to reduce the daily commute. Indorewala adds, “The implementation of BRTS can benefit 0.8 million people as compared to the 0.2 million by the coastal road.” Anirudh Paul, principal, KRVIA, sayS a coastal city like Mumbai must use the waterways transportation on which a lot of work has already been done. Also, faster implementation of the proposed nine corridors of Mumbai Metro will benefit 7 million commuters. Amidst the reservation, a section of experts believes the coastal road has its benefits. Sulakshana Mahajan, a senior urban planning consultant at Mumbai Transformation Support Unit who submitted a comprehensive coastal road plan to MCGM, says the road will shift private car users away from the two main arteries. The freed up road space can then be used to implement the BRTS. She also supports pedestrianisation of city roads and hiking car parking charges. To address concerns of the fishers, she says additional land can be reclaimed to provide facilities in koliwadas. Mukherjee claims the coastal road will have worldclass BRTS, but made no mention of BRTS on the two main arteries. Mumbai is one of the top 10 megacities threatened by the sea-level rise. The coastal road project can help reclaim slightly higher land and implement coastal erosion protection measures, says Sudhir Badami, a city-based independent structural engineer and transportation professional. It can also provide open spaces and recreational spots. But Rishi Aggarwal, a city-based environmentalist disagrees. He says there is enough international evidence to show that building more roads inevitably encourages demand for more private cars. Clearly, the coastal road project of MCGM has a bumpy road ahead. The story appeared in the 1-15 July, 2016 print edition of Down To Earth.